NAIL ART with New Trend Nail polishes HAUL!!!! Being an Artist colours and paints are in my blood. I crave to play with colour either it be Oil paints on big white canvas, pastels on colourful pastel sheet, water paint on Censon white grained sheet, Makeup on face or Nail Paint on my NAILS. Yes Nails as each finger is like a canvas... and recently I have grown a craving of my old love that is Nail painting which these days is called Nail Art. People say when you are depressed do makeup you will be relax, that's true, but my recent Mantra is "Nothing Going UR Way??? 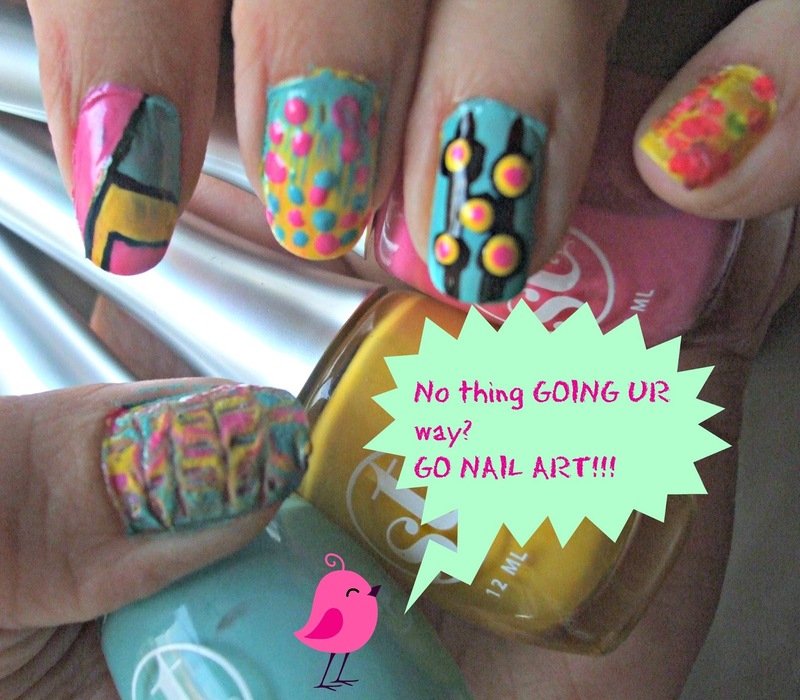 GO NAIL ART!!!" To Know More Read More!!! I bought three nail colours from Sweet Touch Matte Yellow, Powder Pink and Light Turquoise (Pkr 160 each) and one much needed Top Coat in GEL-LOOK by Essence (Pkr 300). I bought these from Hayees at F-7 Islamabad. The colours are neon-y as I wanted the shades to do Trendy Nail Art. 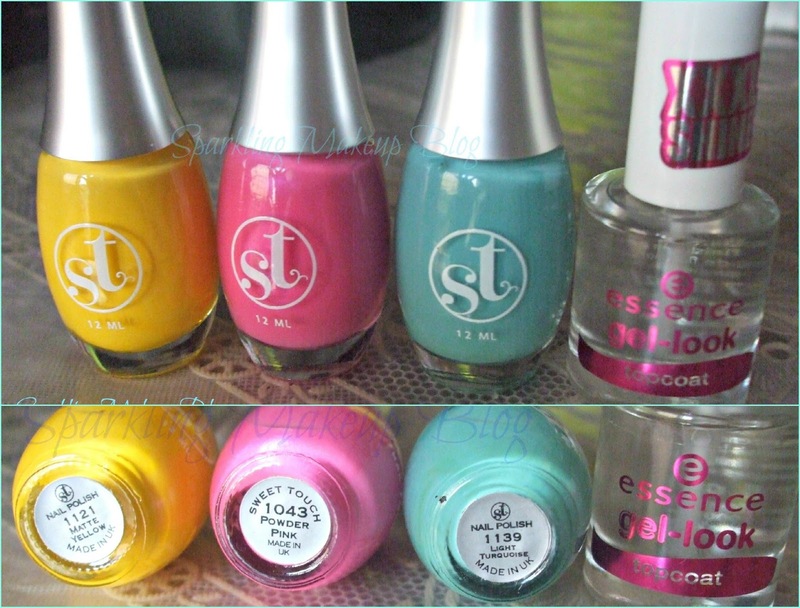 Here is a Dupe alert too... Light Turquoise by ST is same to same as MUSE from Luscious designer collection. I like all three shades and the top coat is also fine. Light Turquoise by ST: This has to be my favourite, it is the kind of Aqua turquoise-y colour I have been looking for in the bottle it is light (milky) but gives a bright shade when applied. 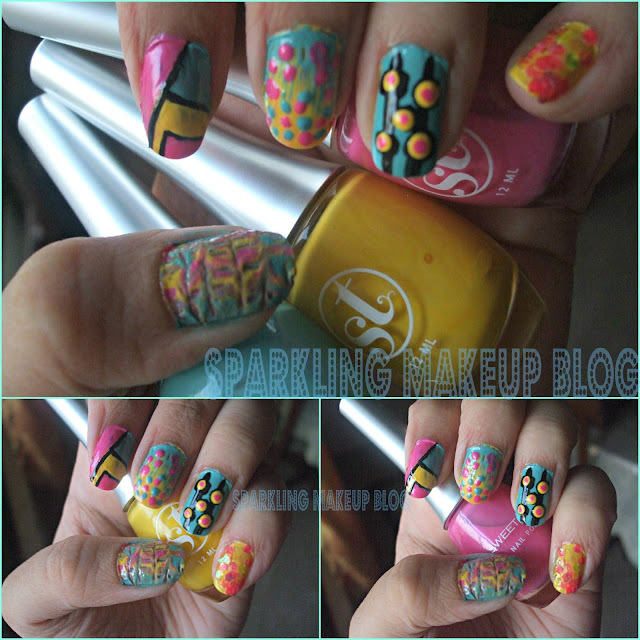 Dupe for MUSE of Luscious designer nails collection, on which I had my eyes since its launch. No shimmer and perfect for the Spring Summer 2013 trend. Gel Look top coat by Essence: I wanted a top coat as that is a MUST for nail art, had my eyes on this, so got it and I must say it delivers tha XXXL shine it promise, you can see the pictures. Gives a good hold to Nail Art accessories like the chunk glitters I applied on my small finger. I am loving it and highly recommending to you all out there. The mess of such creativity! This mess remind me of the time when I used to paint on canvas. :).I do not have separate Nail art tools yet, I used just a few glitter chunks, a wooden dotting tool, a brush (which is actually eyeliner brush), scotch tape, my Crea-Nails protector, allot of tooth picks, cotton buds, tissue paper, a news paper to save your table cloth and ALLOT OF CREATIVITY with few shades of your choice. In case you are wondering for lining I used Black Queen Nail color from Sweet Touch. 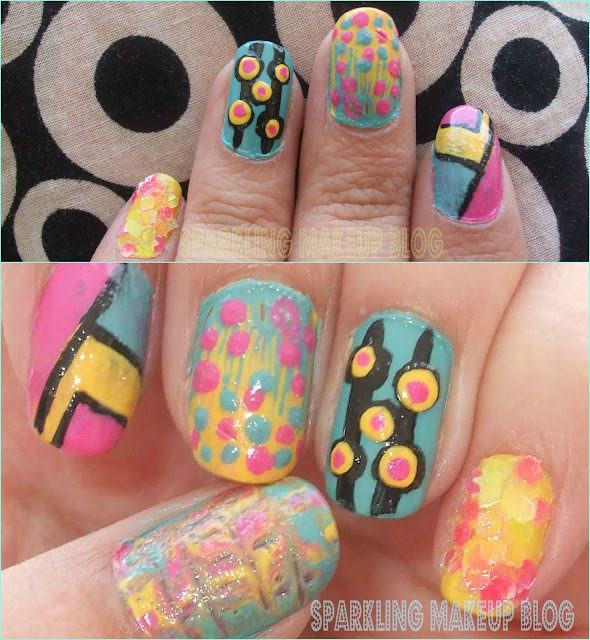 I created five nail art pieces, I love them all, but do share which one do you like the most. I will be waiting for your comments DO BLESS ME. Do visit Facebook fanpages of Sweet Touch cosmetics Pakistan & Essence Pakistan they have a wonderful range of Nail colours and other cosmetics. Hope you like my Nail Art. Do share your views, comment, share, like, tweet, G+ and Pin IT. 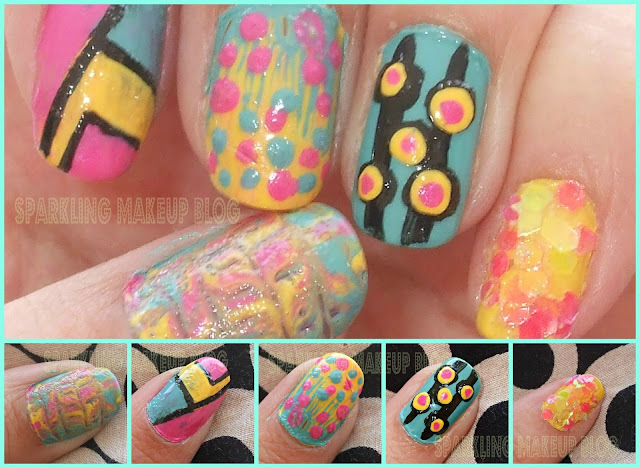 To read my other posts on NAIL ART click the link. 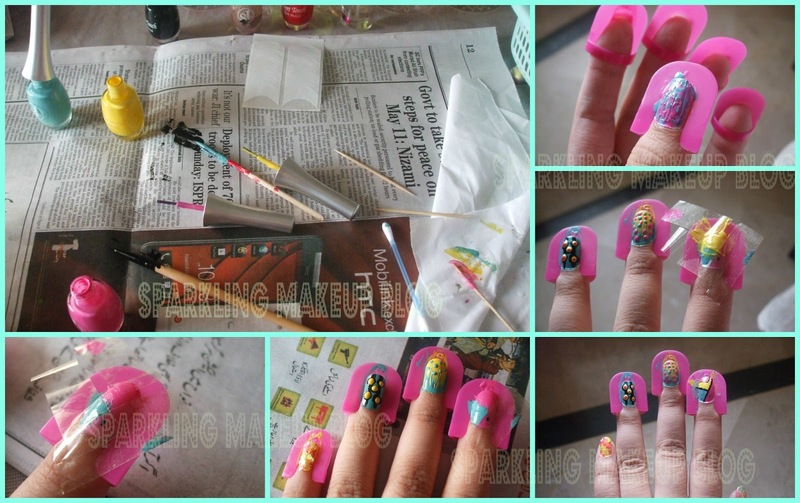 To read my other posts on NOTD'z click the link. woooow! I love them all but the first and third one are ahhhh-mazing! Omg! This looks so cute. Vibrant and summery. Reminds me of Popsicles. Good job!